If this is the summer you have your heart set on staying in oceanfront beach condo rentals in Myrtle Beach then you won’t be disappointed by all we have to offer. We have 33 acres of oceanfront condo rentals with nearly 700 feet of pristine sandy beachfront and crystal blue water you won’t soon forget. 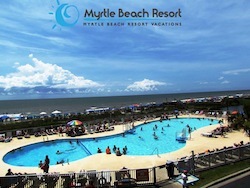 At Myrtle Beach Resort we want to make this the best part of your entire summer and we’re confident we can do that! Our water park includes a 375 foot Lazy River and wet deck, four (4!!) outdoor pools (one of which is beachfront) and two indoor pools. We have three health spas complete with saunas, steam rooms and Jacuzzis available anytime for you to enjoy. If sports are what gets your heart rate up then check out our game room, two tennis courts and a basketball court lit up for night play. When it comes to looking for something special and out of the ordinary to do, you won’t have to even leave the resort to check out Chief Kamu’s Fire and Hula Show. 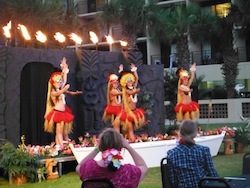 Every Tuesday night beginning at 9:30 p.m. Chief Kamu will lead a Fire and Hula show for guests to enjoy. If you’ve never seen a hula show before you’re in for a big treat. Bring the whole family and watch the kid’s eyes light up! We want you to know that not all oceanfront resorts in Myrtle Beach offer all the amenities that we do here at Myrtle Beach Resort. Our on-site dining venues alone far exceed what other resorts have to offer. The Oceanfront Cabana located by our oceanfront pool offers everything from snacks to adult cocktails to a light meal. Looking for snacks to tide the kids over? No problem! Our Lazy River Snack Shop has just what they’re looking for. But when it comes to having a sit-down meal, our own QuarterDeck Beachside offers breakfast, lunch and dinner. From fresh seafood, burgers, chicken and nachos to live music and dancing every day, this is definitely the place you’ll want to stay at. If you have any lingering questions or would like to make your reservations by phone, just give us a call at 1-888-826-4018. We’d love to hear from you! This entry was posted in beach condo rentals in myrtle beach and tagged beach condo rentals in myrtle beach on May 22, 2014 by Myrtle Beach Resort Staff.